Holiday Season is just around the corner and FedEx is predicting “a record-breaking holiday season, forecasting shipments between Black Friday and Christmas Eve will jump about 12% from last year,” according to http://fortune.com/. “Many forecasters are forecasting a 3.5%-4% overall increase in total holiday sales, a deceleration from last year’s 5.2% growth. But the e-commerce segment remains a hot growth area as more shoppers move online for their holiday shopping needs. E-commerce sales are forecast to rise between 6% to 8% in 2015, hitting as much as $105 billion, the National Retail Federation has estimated,” Fortune.com also noted. As usual, we have decided to monitor 11 of the most popular websites for shopping online. Considering the forecasts above, however, we must note that such an increase in e- commerce may turn horribly wrong for some of these websites if they are not prepared to bear the heavy traffic load. In other words, the heavy traffic may cause the website to slow down or to crash which then may lead to a number of lost customers. Thus, keeping your website up and running at all times is of utmost importance. We will be publishing daily reports of each of the monitored websites in the period between November 24th , 2015 and January 4th, 2016, so stay tuned. 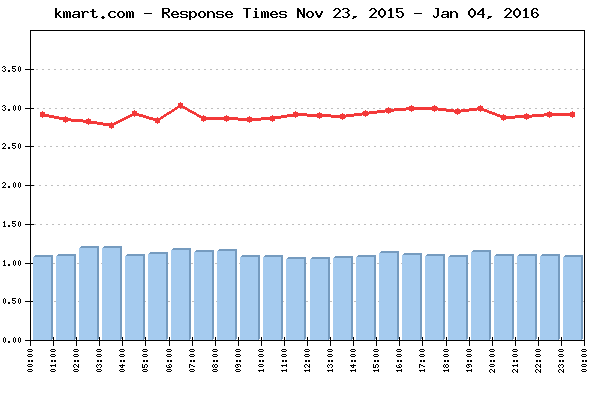 The daily Average Response time from all monitored websites was 2.889 sec. The Average Response time as measured from the US East Coast (Washington DC) was: 2.657 sec. The Average Response time as measured from the US West Coast (Los Angeles, CA) was: 3.265 sec. The Average Response time as measured from the US Central was (Chicago, IL): 2.744 sec. 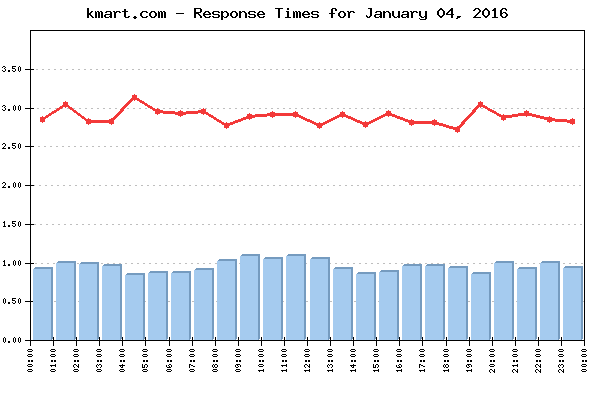 The Best Response time measured from US East Coast (Washington DC): 0.821 sec. The Best Response time measured from US West Coast (Los Angeles, CA): 1.095 sec. The Best Response time measured from US Central was (Chicago, IL): 0.845 sec. The typical shopping transaction took the least time for kmart.com visitors - 0.948 sec., while the visitors of amazon.com had to be the most patient, as the shopping transaction there took in average of 5.386 sec. 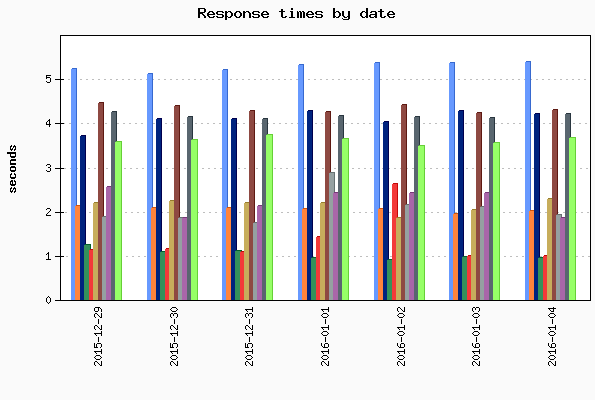 Five of the monitored websites delivered above-the-average response times for their transactions, while six of them demonstrated below-the-average daily performance. No events of particular importance or possible negative impact on the online visitors' interaction with the Websites included into the 2015 Holiday Season report were detected during the reported period, and according to WebSitePulse, the Group delivered the expected levels of End-User experience and Customer satisfaction. The 2015 Holiday Season Reports reflect a complete web transaction, representative for the End Users' interactions with a website. The reporting period covers the dates between November 24, 2015 and January 4, 2016. Performance and availability measurements are made for a typical multi-step web transaction at 15 minute monitoring interval, every day 24/7. The WebSitePulse application monitoring service is used to collect data and to create the reports. The steps in each transaction are comparable for all websites, and reflect the real online shopper experience. The simultaneous monitoring is performed from 3 US-based locations of the WebSitePulse monitoring network: Los Angeles, CA, Chicago, IL, and Washington, DC. In case of a detected malfunction or unavailability, the system performs automated error verification from 3 independent resources and only after the above procedure is performed and has returned consistent results, the detected error is confirmed, recorded, and included in the daily performance reports. In these cases, an advanced WebSitePulse exclusive feature comes into play - Forced Monitoring -, which automatically switches to a 3 minute monitoring interval for increased accuracy.